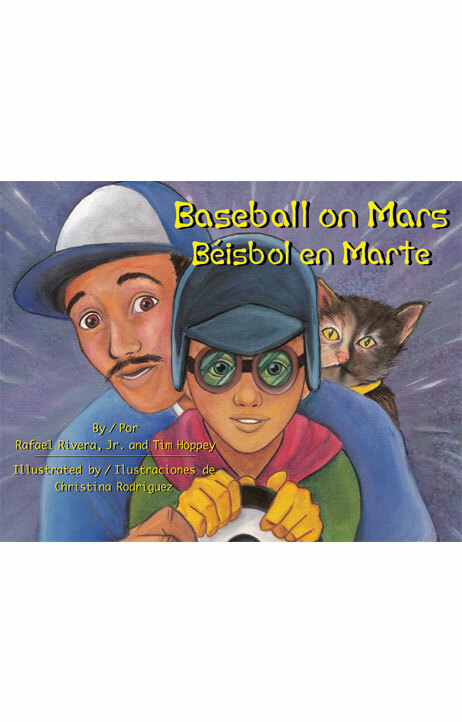 A heartwarming bilingual picture book about a boy and his father, who bond over a game of catch on the Red Planet. Roberto’s dad speaks in Spanish when he gets upset, and boy, is he unhappy today! His lucky chair—the one he sits in to watch his beloved New York Yankees play—is missing. And he needs it for the afternoon game against the Red Sox! Roberto is excited, too. He’s about to take off to Mars on his home-made rocket ship, and his dad’s lucky chair makes a perfect pilot’s seat. When his father finds that the missing chair has become part of the rocket ship in the backyard, he grudgingly tells Roberto he can use it—for now. But it needs to be returned before game time. Roberto’s dad is skeptical about the rocket ship. “You might have a problem getting off the ground,” he says. “You’re forgetting one little thing—you don’t have an engine!” Soon, he finds himself invited along as co-pilot. And during the exciting flight to Mars, Roberto helps his father rediscover his imagination as they experience an amazing blastoff, wayward asteroids, and even weightlessness. When they finally land, Roberto surprises his father with two baseball gloves and a ball. “Today’s baseball game is on Mars,” he tells his dad. After spending the day playing catch, father and son realize that they speak the same language on the Red Planet. And his dad doesn’t even mind that he missed the Yankees’ game! Children ages 4-8 will want to embark on their own mission to Mars after reading this story that combines vibrant illustrations with a touching story about a father and son’s afternoon adventure. RAFAEL RIVERA, JR. was born and raised in the Bronx, the setting for this story. He is a New York City firefighter stationed in Spanish Harlem. He has two young daughters with whom he hopes to build rocket ships. He is a lifelong New York Yankees fan, but does not have a lucky chair to sit in. TIM HOPPEY is a New York City firefighter stationed in Spanish Harlem. He is the author of a bilingual picture book, Tito, the Firefighter / Tito, el bombero (Raven Tree Press, 2005). He lives on Long Island with his wife and three children.